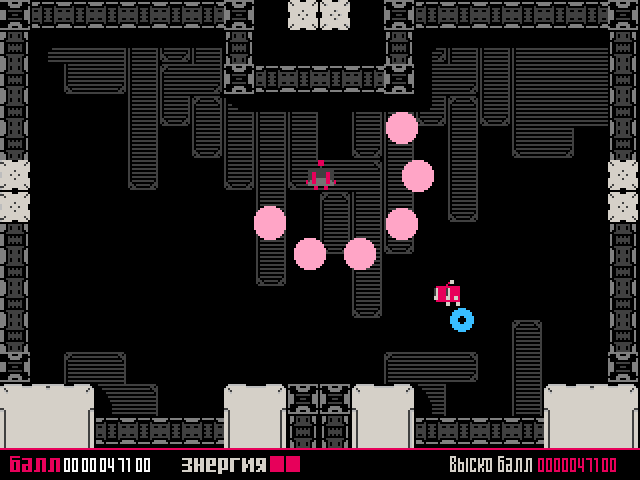 As you may have guessed from the title (kolkhoz being the name of the large scale agricultural operations in Soviet Russia), Kolkhoz 2928 is a farming platform game set in dystopian future wherein cute Russian robots are forced to farm genetically modified pomegranates (called Guranato) to feed the starving world population. The single screen game-play is very simple; collect the crop when it has ripened and avoid contact with the other droids, your aim being to meet the point quota on the counter in the middle of the screen. 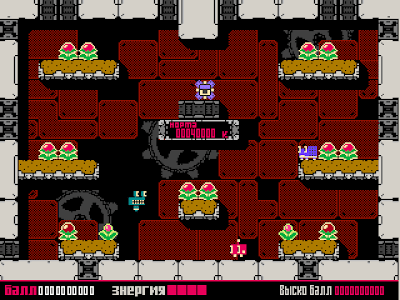 At first glance you are probably thinking (like I was) that it looks like a winning formula, similar in style to the arcade classics Rodland and Bubble Bobble, but with super-cute robots instead of wand-waggling fairies and bubble-spewing dragons. 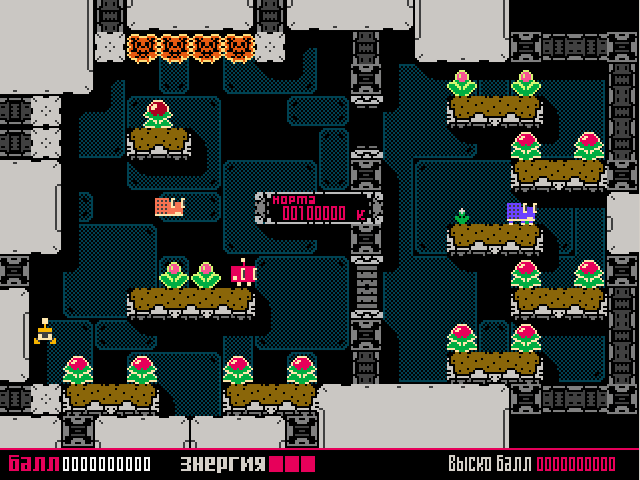 However, it seems that the developers have taken the menial nature of working in a kolkhoz a little too seriously, with rather oversized quotas to meet on each stage - even the first level requires a whopping 40,000 units to clear, and it just goes up and up from there. The crop takes a few seconds to grow from seed to full size, after which it deteriorates and dies. The idea is to grab each Guranato at it's peak (when it is worth 500 points) - collect them too early and you'll be awarded a lesser amount and if they are left to rot then you'll lose 300. Initially this sounds cool - and it is always fun at the start of each stage when the plants are growing at different rates, but you'll soon discover that to win you simply have to traverse the levels in a circular fashion over and over (and over and over), avoiding or disabling the other droids as you go. Your serf-bot has a nifty jumping technique, producing a little engine flare (aka fart attack) that can be used to stun the enemies every time you hit the jump button whilst already in the air. It's a little harder to pull off successfully than it sounds, and as the robots come back to life after a couple of stunned seconds writhing in pain you'll probably find it easier to just avoid them instead. Each time you touch another droid, get shot or crushed by a door you'll lose a bar of energy, but these are easy to replenish thanks to the plentiful first aid boxes that spawn above the quota meter. Little bonus crosses also appear occasionally (worth 10000 points), but this doesn't affect your quota at all so there's no incentive to break your crop gathering cycle to grab them. You've probably guessed by now that I can't quite make my mind up about this one. 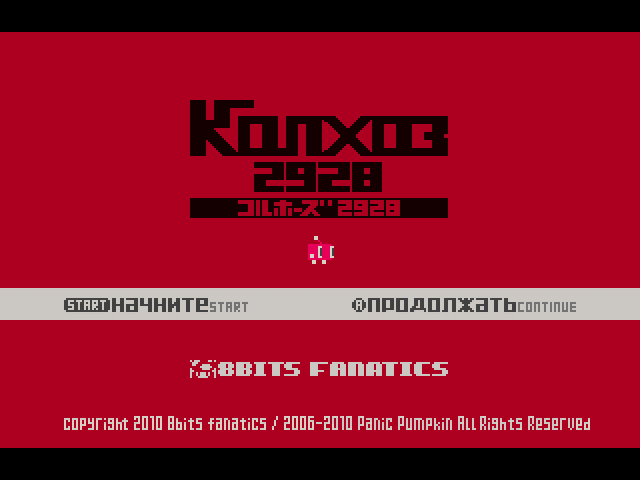 8Bits Fanatics II have lived up to their name, creating a beautiful and very retro MSX/NES stylised game, and the short and repetitive Russian themed chip tune is both incredibly annoying yet compulsive and charming at the same time - which is pretty much the way I feel about the game as well. 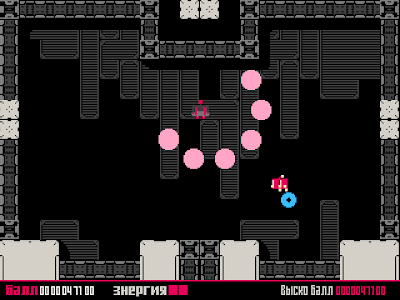 Kolkhoz 2928 tries to break up the repetitive game-play with bonus stages and a couple of easy boss battles, but these serve little purpose other than a few seconds amusement. The ambiguous and quirky Russian/Japanese interval screens between stages make a welcome distraction, but none of this really helps - the game still falls short on a couple of key areas. The crop quotas are simply too big, and the game doesn't become even remotely challenging until it loops the ten levels - after which point the music will have driven you ever-so-slightly insane anyway. As my good friend ptoing pointed out, "it's not hard but it is boring, and that is the worst combo"; which is all good and well, but when I asked if he was going to delete it and never play it again he couldn't give me a definitive answer. Even whilst writing this review I still myself being pulled back again and again for another go and I can't identify why. It's frustrating that the game is so fundamentally flawed, because there are some decent ideas here and it has to be about one of the nicest looking single-screen platformers I've played in ages. Perhaps the huge quotas are a deliberate attempt to capture the feeling of working in a kolkhoz? I just don't know, and as a result of this I can neither score or recommend the game. Kolkhoz 2928 is a genuine curiosity. 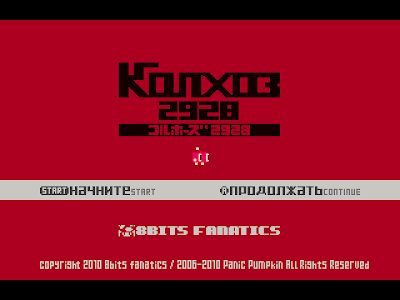 Download the game here (from the 8Bits Fanatics II website). Kolkhoz certainly is a weird little game. The setting is quite funny, the mechanics are alright as well (collecting fruit before it wilts, 'farting' on enemies to stun them). The graphics are charming NES style fare, very cute and nicely done. The music grates. It is the same 10 or so second loop over and over again and gets old very fast. The main problem is, as James already pointed out, the growing quota, which gets pretty big. That and the gameplay basically consisting of collecting everything in a nice route and then doing this over and over again (not exactly exciting) makes it feel more like work than a fun game. But perhaps this is what they wanted. Which would kinda put it into the category of joke (or dare I say art-game, but let's not go there). Better music, smaller quotas, faster gameplay, some power-ups to be able to kick the enemies asses properly and perhaps respawning enemies and this would be a gem, like it is now I would only recommend it to the terminally bored.